Movie: "Harry Potter and the Prisoner of Azkaban"
An insane wizard named Sirius Black (Gary Oldman) has escaped from Azkaban prison. He is believed to be a follower of Lord Voldemort. Now that he's free, Black is coming for his next target: Harry Potter. 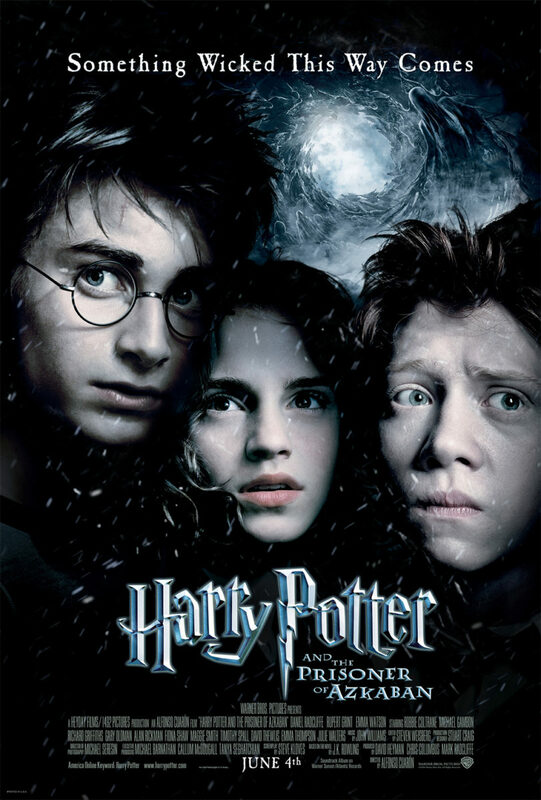 "Harry Potter and the Prisoner of Azkaban" is the third installment in the Harry Potter film series. This particular movie marks a turning point in the franchise. Alfonso Cuarón, the director of "Y Tu Mamá También," "Children of Men," and "Gravity," takes over the directorial duties from previous director Chris Columbus. He brings his masterful visual style and his unique, compelling, and rich point of view to the narrative involving The Boy Who Lived. The majority of the cast returns for this entry, including Daniel Radcliffe, Emma Watson, Rupert Grint, Alan Rickman, Maggie Smith, and many more. There is one big change in terms of actors here, and that is due to the passing of Richard Harris, the original Albus Dumbledore. In his place is Michael Gambon, who takes over the role for the remainder of the franchise. Much like previous film, a couple of new characters are added to the Harry Potter universe, including the new Defense Against the Dark Arts teacher Professor Lupin, played by David Thewlis, the wacky Professor of Divination Sybil Trelawney, played by the wonderful Emma Thompson, and the escaped criminal Sirius Black, played by the incomparable Gary Oldman. We are also told a lot more about Harry's parents and how they were betrayed by their friend Peter Pettigrew, played by Timothy Spall, as well as their connection to Sirius Black. We mentioned earlier that "Prisoner of Azkaban" represents a turning point for the Harry Potter series, and Curón does a wonderful job representing that shift on screen. The film starts off very light in tone, displaying many comedic moments and putting on full display the whimsy and wonder of the wizarding world. Midway through the movie, we see a shift to a darker style of story, displaying the dangers and the ugly side of this universe. It is this darker side of the fantasy world that will become the focal point of the upcoming movies from here on out. This third installment in the franchise introduces the dementors, dark beings who guard Azkaban prison and feed on any happiness inside of people, leaving them with only their worst, most tragic memories in tact. One of the great things about the Harry Potter universe is that it matures with its audience, offering far more adult themes as the years pass and as the protagonists age. Much like the previous two films, we have a wide variety of wonderful acting in "Harry Potter and the Prisoner of Azkaban." The new additions to the cast really bump it up in terms of unique characters and seasoned actors, and Radcliffe, Grint, and Watson have grown into their roles not just physically, but in their acting abilities as well. With such a stellar, compelling narrative, and its fair share of exciting action, this third installment in the Harry Potter series is one of our favorites. We love the darker shift in its storytelling and the magnificent CGI, and its in this sequel that we start to see pieces of the ultimate puzzle being put together in a bigger way.